When any member of the Chas Madonio family discusses their family, they are not just talking about the human members, but also all of the four-legged members. 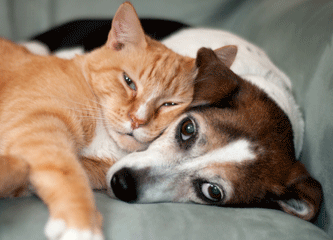 Dogs and cats are referred to and treated as family. They are given all the same advantages as the human members, and are loved equally. With this backdrop, Chas Madonio wanted to do something for dogs and cats not as lucky as the ones he and his children have adopted. He announced recently the establishment of the Madonio Family Animal Welfare Trust, www.madonio-animal-trust.org, a fund managed and administered by the Portage Foundation, a group that he served as a trustee. The purpose of the trust is to accumulate donations and use the earnings to support no-kill animal shelters and rescues and other animal welfare projects within Portage County. In addition to dogs and cats, other animals, such as horses, pigs and all farm animals can benefit from the trust. The fund was started with a $10,000 donation from the Madonio family to the Portage Foundation and hopes to grow in several ways – contributions from anyone sharing the same love for animal rights and care, bequests in wills, and those who wish to pledge life insurance proceeds. The goals are to raise enough money to support all the organizations in Portage Co. that would help make the county a 100% no-kill county and to offer financial assistance in helping sick and abused animals. “Every animal’s life is precious,” said Chas Madonio, founder and benefactor of the trust. “I have a rescued dog, Willie, that was days away from being euthanized when we rescued him. It would have been a shame if he had been put down, because we have gotten 9 years of love and devotion from him. We would have missed so much without him. Yet dogs and cats like him are put to death every day. We hope to put the brakes on that as much as possible”. Another goal of the trust is to provide money to help in the treatment of sick, injured or abused animals. All funds raised will go into the trust and none will be used for promotion. The family has pledged they will personally bear all costs of promoting – printing, mailing, web-site design and maintenance – so that all money pledged will go directly to the care of the animals. See www.madonio-animal-trust.org for more information.